WARNING: If you received the POP Beauty Plump Pout Mini gloss from the February Ipsy GlamBag and if your gloss smells bad in any way DISCONTINUE using it, if you have not used it DO NOT use it! A few days ago I posted about the POP Beauty Plump Pout mini vs the full size and talked about how the ingredients are different. I contacted Ipsy about it who in turn contacted POP Beauty and what we were told by POP Beauty is something I can't believe which resulted in my posting this follow up post. Ipsy has contacted Pop Beauty who has in turn said that the reason the minis smelled bad was due to an ingredient being left out however the glosses were "safe" to use. I absolutely disagree since I've been reading complaints from various people on Ipsy's Facebook page, my own Facebook page and POP Beauty's Facebook page complaining about chemical burns and negative reactions to the product. 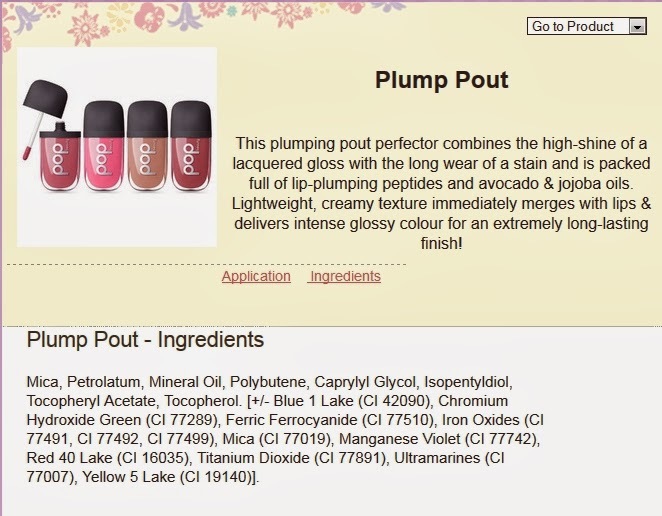 A complaint made on POP Beauty's Facebook page about the Plump Pout causing a chemical burn on lips after using item. While this item is suppose to contain an irritant to plump up the lips it should not cause a chemical burn or harm your lips. If you experienced such a reaction you should report it to the FDA. Katz says consumers should contact FDA if they experience a rash, hair loss, infection, or other problem—even if they didn’t follow product directions. FDA also wants to know if a product has a bad smell or unusual color—which could signal contamination—or if the item’s label is incomplete or inaccurate. I still have numerous unanswered questions which POP Beauty has yet to address as of this blog post. Why haven't the ingredients on the website been updated to reflect the minis and/or full size? Note: As of 3/8/2014 both Ipsy & POP Beauty have updated their pages to reflect the correct ingredients. See update at bottom of blog post. How has POP Beauty determined that the products are safe to use? How does POP Beauty know if the products are not contaminated? How does POP Beauty know only a "small batch" were affected since the minis do not contain a lot # or batch # printed on the tube or on the shrink wrap with the ingredients? How can POP Beauty's manufacture be sure that there were no other issues with the manufacturing of the minis other than "leaving out an ingredient"? Which ingredient was left out? How do they know it was only a "flavouring ingredient" that was left out? Has POP Beauty sought an independent lab, such as SGS, to test the minis in order to rule out contamination or hazardous ingredients? Will Ipsy and/or POP Beauty make a full public announcement on the matter? Does this warrant a recall since the ingredients in these products are unknown and therefore are potentially misbranded per US FDA regulations on listing ingredients on products? It is the manufacturer's and/or distributor's responsibility to ensure that products are labeled properly. Failure to comply with labeling requirements results in a misbranded product. (a) Among representations in labeling of a cosmetic which render such cosmetic misbranded is a false or misleading representation with respect to another cosmetic or a food, drug, or device. (b) The labeling of a cosmetic which contains two or more ingredients may be misleading by reason (among other reasons) of the designation of such cosmetic in such labeling by a name which includes or suggests the name of one or more but not all such ingredients, even though the names of all such ingredients are stated elsewhere in the labeling. A comparison between the mini versus full size. Color difference due to different Red Lakes used? Ingredients listed on Ipsy's website. Ingredients listed on POP Beauty's website. 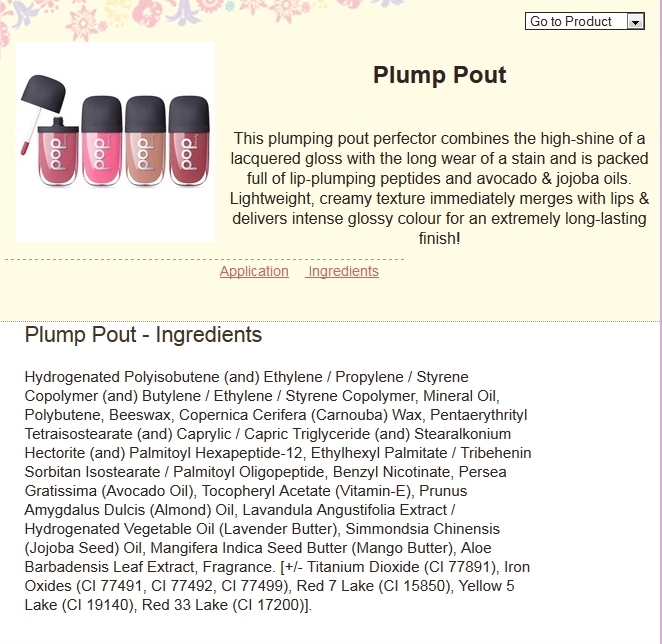 Ingredients listed on the full size Plump Pout. Side-by-side comparison of ingredients in mini gloss vs full size. Both Peony Petal. As you can see for yourself the ingredients on both the Ipsy website, they received the information from POP Beauty, as well as on the POP Beauty website do not match the ingredients on the shrink wrap nor on the full size. What I was essentially told by an Ipsy representative, something they were told by POP Beauty, is that the horrible smell is due to an flavouring ingredient being left out, I just find hard to believe. I do know it was not POP Beauty's intent to send out, essentially and potentially, defective lip glosses however I am extremely disappointed by Ipsy and by POP Beauty by not issuing a recall on these items because there is no way to know if POP Beauty's manufacturer in Taiwan is telling POP Beauty the truth. I firmly believe that POP Beauty and Ipsy cannot guarantee that only an flavouring ingredient is missing and the reason it smells so bad unless an independent lab tests numerous minis from the Ipsy warehouse. While the FDA does not regulate the industry by actively policing cosmetic companies they can and do enforce the laws and regulations either by requesting a company issue a recall, prohibiting imports of products from foreign countries or issuing recalls themselves if the company does not. This is why it is critical to report ANY reaction you've had even if it's "just" a "bad smell" to the FDA because only the FDA can force POP Beauty and/or Ipsy to look into the matter more seriously. I also don't believe that it affected only a "small batch" due to the fact that a "gasoline", "burnt plastic", "burnt rubber", "jet fuel" smell has been reported by people for BOTH colors - Peony Petal and Fuschia Freesia. I do know that there are people who have not contacted Ipsy and/or POP Beauty about their gloss simply because they either do not want a replacement or do not think either Ipsy or POP Beauty will take them seriously. If you (subscribers with defective glosses) do not contact them they will continue to think it was only a "small batch". I do not blame Ipsy on the potentially defective POP Beauty Plump Pout lip gloss however I do think that Ipsy does have a responsibility to their subscribers to ensure the safety of those customers by sending to ALL subscribers an email telling customers to discontinue using the product and/or do not use the product if they have yet to use it until POP Beauty can guarantee and prove that the items are indeed safe to use. If numerous people are reporting that the item smells like gasoline, burnt rubber, burnt plastic, jet fuel then obviously there is an issue more serious than a flavouring ingredient having been left out. I want proof that the product is safe. Please do the right thing and issue a public press release issuing a recall on the minis or at the very least issue a press release telling people to discontinue using the items until you can have an independent lab verify that the items are indeed safe. POP Beauty has removed, from their Facebook wall, numerous comments about the smell of the mini. They continue replying to people that the reason for the smell is a lack of a flavoring ingredient. I have emailed them a list of question (see above) and have yet to get a response. I feel that they are trying to sweep it under the rug rather than acknowledge there was a major manufacturing problem. If it turns out the products are contaminated and have refused to make a public announcement telling people not to use it then it's possible they could be held liable for anyone getting injured from the product. Posted by one of my readers on Facebook. Date 3/7/204. Ipsy's response to another person. POP Beauty's reply to someone else. Image from Ipsy's Facebook wall. Shame on POP Beauty! They removed my post from their wall and have deleted ALL comments about the minis. They continue to promote the minis. As a consumer I DEMAND that they PROVE the products are safe. Their word on the matter proves nothing, company reps and owners lie (I've seen it from Two Cosmetics). I have spoken to someone at the FDA office in Seattle (a few days ago actually) and will be filing a report with the Washington State Attorney General AND the Federal Trade Commission. POP Beauty should be recalling those glosses NOT hiding the fact that people have been and continue to report that the glosses smell acrid! I noticed that both the Ipsy and POP Beauty site have finally updated the ingredients listed on both sites. 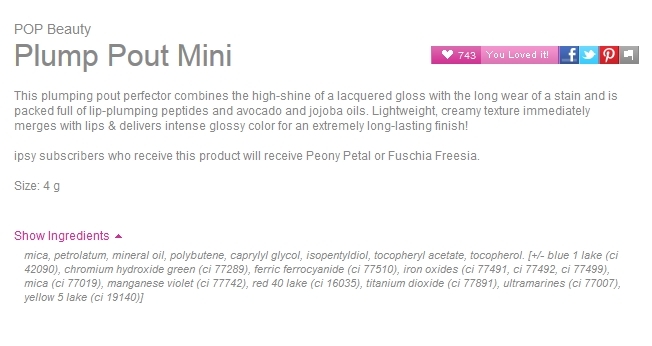 The POP Beauty site reflects the ingredients from the full size while the Ipsy site reflects that of the minis. Part of the email from Ipsy in regards to the difference between the full size and mini ingredients. "We have since learned that POP has recently undergone both a formula change and a change in manufacturing partner to make the lip gloss. This formula change was already in the works when POP and ipsy began discussions regarding the February sample and we were always contemplating the newer version of the product. The full size products that were sent out as replacements are the last batch under the previous manufacturer. The new manufacturer (located in Taiwan) made the Glam Bag samples and will make the full size product going forward. While the manufacturer is "new" for this particularly product, POP has been working with that manufacturer for 15 years, and has a strong and trusting relationship with the team (mistake on the flavor/fragrance aside). Finally, while it has some different ingredients, the new formula has been approved by the brand to deliver the same results and customer experience as the previous formula, and from the brand's perspective, is not a reduction in quality, again absent the mistake on the flavor/fragrance." Full size item sent to me by POP Beauty as a replacement for my defective mini from Ipsy. Email them again because Ipsy is aware there is a problem. POP Beauty is now essentially telling people it was a flavoring issue (missing a flavoring ingredient) and are no longer offering replacements for the items. So it's up to Ipsy now to deal with the situation and offer a replacement. This is why I think Ipsy should make a public announcement about it. I contacted them & they said they were send me two "surprise" replacements int he mail without any pushing. But they did say it is perfectly safe to use, Ipsy did I mean. I emailed Ipsy and they told me that it is safe, they are sending me a surprise and I should contact POP for a full size replacement. Update: Tiffany shared this email from POP Beauty this morning. It looks like POP Beauty no longer are offering replacements and according to another reader, Ipsy has told her to contact POP Beauty for a replacement. Thanks for shedding light on this topic to the public. As a cosmetic chemistry student, I know for a fact that it wasn't just the flavoring substance missing from the so called "bad batch." Many products (mine included) were missing the irritating agent as well as the flavoring agent. It's horrible to see someone chemically burned. I do agree with you though. There should be an immediate recall especially since the ingredient label was misleading. This is a hazardous product to have circulating. As a cosmetic chemistry student, do you think that in addition to having the irritant and flavoring being missing that the acrid scent in both shades could be due to either a preservative being missing or not enough of it OR even that the shrink wrap process with heat could have potentially damaged the glosses? Granted, you can't be certain but could those theories hold merit? Now fragrance is a trade secret and most companies won’t post what they use for the fragrance. However, most of these oils used are very irritating for skin, so that could be a major player in some people’s reactions. Another big one is Silica. Now it doesn’t say what form of it is in the product (liquid/solid/etc.). However, silica is a desiccant, which draws out moisture, which describes a lot of the subscriber’s frustrations with their dry lips. It is also the irritating agent. Now for the chemical burns, there are a few ingredients in the formula that are placed there to treat the burn, but maybe they were left out? I don’t know. It’s just mind boggling to see the comparisons side by side. POP has done everything in their power to completely not directly face the subject and announce a proper agenda. They claim it’s safe, and while yes, the ingredients are safe alone, together can be a catastrophe, especially if some ingredients are left out or if the pot was contaminated, which can start an unwanted reaction within the formula. I've contacted both companies and have expressed my concerns, but I have not heard anything back from either side. Hope this helps, and thank you for shedding light about this situation. I appreciate it! Hmm. I must've gotten a good one then, because mine has no smell and it's become one of my favorite lipglosses. That's sad that some were defective. It's really a great product. I don't think it's ipsy's fault, if they'd known the lipgloss was bad they wouldn't have sent it out. Pop's incompetence or were they trying to make ipsy look bad on purpose? I had horribly chapped lips after using it, but I had used chapstick before and after using it. So glad the reaction didn't happen DURING my job interviews I had the day I used it. I was excited thinking it'd be good luck to have something new and shiny. Why don't people go /directly/ to Pop's product page and leave a review and on amazon/ebay if you can buy this item here? I don't blame Ipsy on this matter too much since they're taking POP Beauty's word on the matter that the problem was a left out flavoring ingredient and that the products are safe. I just wish Ipsy would publicly state until they have proof that the products are indeed safe, people should discontinue using it. They also need to stop sending out the different emails where one person says that the items are fine and safe/no problems and the other acknowledging a problem by reiterating what POP Beauty told them. POP Beauty may be relying on what their manufacturer told them but unless they have proof there is no way to know that their manufacturer is telling them the truth. They don't know, we don't know, no one knows for sure if those glosses are safe or not. As for why people haven't gone directly to POP Beauty product page and leave a review... that's not possible. They don't have a review system on their site and they have been removing (deleting) comments about the matter from their Facebook wall. As for Amazon/EBay... reviewing there doesn't really apply since the items sold there are typically the full size not the minis which contain different ingredients. I contacted health canada and I'm waiting for a response. I still got no answer from pop beauty and ipsy. I'm very disappointed at pop beauty for deleting posts and pretty much ignoring the negative posts. Pop could learn from those posts. I agree. The posts made by people haven't been overtly negative much less threatening so in my eyes if those posts were left alone it would help other people. As for Ipsy and POP not yet replying, email them again and let them know when it was you last attempted to contact them. I'm sure both are overwhelmed with emails but it shouldn't take more than a day or two to hear back. At this time I don't think Ipsy plans on making any public announcements. I'm still waiting for POP to do so since I was told by one of their representatives that they would. I never opened or used it. I just saw that I did get it in my Feb bag. I canceled my ipsy so not sure if I should bother contacting them. I opened mine and it does smell bad. Please contact them regardless if you cancelled. They're convinced it only affected a "small batch" and the only way they'll know it was more widespread is for people to contact them. I highly doubt anything is severely wrong but I could be wrong. I have wordpre dfor big companies as a quality control inspector and they do inspections of the product hourly. But if this happened in Taiwan then I'm not sure. Not only are both companies refusing to answer upset people, but now Ipsy is deleting comments and threads posted on their Facebook and limiting the complainers' ability to post. While I realize that this is their prerogative over content, the company is public, and it's not a "fan club" situation. This is a serious issue, likely warranting legal action at some point. I think both companies failed to respond with any due respect to customers. Complaining to the FDA will not be enough. I have to agree. I'm disheartened to think that Ipsy won't send out a mass email in regards to the Plump Pouts since many of their subscribers do not use social media and might not know what had happened and had not contacted Ipsy yet and instead just threw the product away. The FDA doesn't regulate cosmetics, so it would be very hard to fight in court for. It's basically testing the company's integrity, which in this case, we can see where its standing. You're right, they don't but they do investigate complaints. I have spoken to a FDA agent in the Seattle office and was told there are steps the FDA can take if need be however it requires people to file complaints so they can look into the matter. In some cases they will ask the company to do a voluntary recall as they can't force them to or issue their own recall on the product or products they're investigating. In other cases they can also get other government agencies involved. As the person I spoke with the FDA is not a policing agency however they can take action when needed and if needed. I haven't used my lipgloss yet, and after reading this I'm now a little nervous to... I am at work, and will definitely open up the lipgloss and smell it when I get home. I also emailed IPSY about the situation - I explained I haven't tried it yet, but after seeing all this, I'm not willing to risk having a bad reaction. I'll be curious to see what they say (or if they even respond)! If you plan on trying it please do it on the back of your hand first. Some people have experienced a reaction to it including welts or a rash, others have had no issues with that at all. If you do have a reaction please document it with photos and send it to Ipsy and POP Beauty if you do not wish to report it to the FDA.